As a second entry, they will offer you a variety of dishes with meat, chick and fish. For example Stroganoff (beef cut into fine pieces, with a cream sauce), or Shashlik (spikes, original dish of the Caucasus), different types of beef steaks and stuffed chicken. About fish dishes, you can found the salmon, trout, sturgeon, cod and some other fish. In luxury restaurants you will find Mediterranean fishes and seafood. The meat is usually served well made, because the Russians are not accustomed to the raw meat. Another traditional dish of Russian food is called "pelmeni" and resembles "ravioli", which is eaten accompanied by "smetana" (it is a soured cream), butter or ketchup. It is a dish original of the Siberia and to Siberia has come from China. Another version of "pelmeni" is "varéniki", which are bigger and with other fillings; for example with potato, cabbage, sweet cottage cheese, sour cherries. These meals can be eaten in normal cafes or restaurants in luxury, but also sold frozen in supermarkets or are made by hand at home. 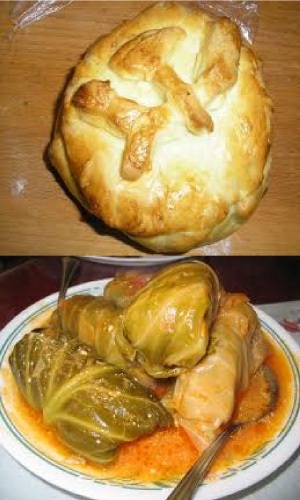 Another popular dish that can be found will be "golubtsí" (cabbage leaves stuffed with meat with rice). They usage of vegetables as garrison in Russia is very common. You can eat potato, prepared in different ways (boiled, fried, mashed, etc.). Other vegetables, pasta, rice, buckwheat or buckwheat is also used (in Russian this cereal called "grechka", unknown in occidental countries). Beetroot (cooked) is used for soups and salads. Many dishes (such as soups, salad and potatoes) they are served with sour cream that known in Russian as "smetana", (very typical Russian gastronomy), but also commonly used in Baltic countries, as for example Ukraine, Belorussia and other countries of the region. Desserts and appetizers of origin Baker among the "Shokolade Syrok" which is a sweet mass bathed in succulent chocolate. This mass may be prepared to base of jams, chocolate, milk and other ingredients. Russian desserts are authentic Delicatessen to try. For example the Vatruska, that is a hot cake of cottage cheese with raisins, the Napoleon cake, composed by layers of puff pastry and caramel. Desserts and appetizers of Baker origin the "Shokolade Syrok" is one of the best, which is a sweet mass bathed in succulent chocolate. This mass may be prepared by base of jams, chocolate, milk and other ingredients. The fruits are also an important ingredient in many deserts of Russia, specially the soft fruit such as raspberries or currants. The best proof of this is the mousse of cheese with red fruit which, usually prepare to celebrate the Russian New Year’s, the 18th of January.